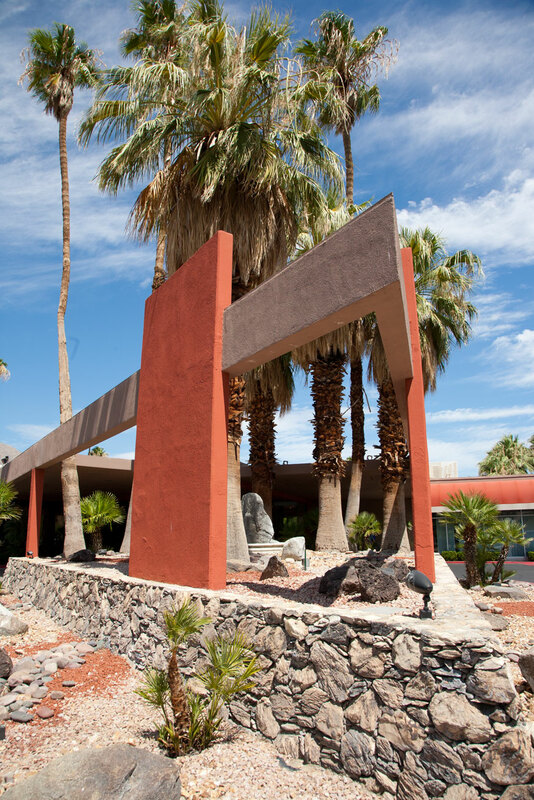 Building at south end of Palm Springs with angular architecture above rock bed. Tahquitz Canyon Way looking toward downtown and San Jacinto Mountain. 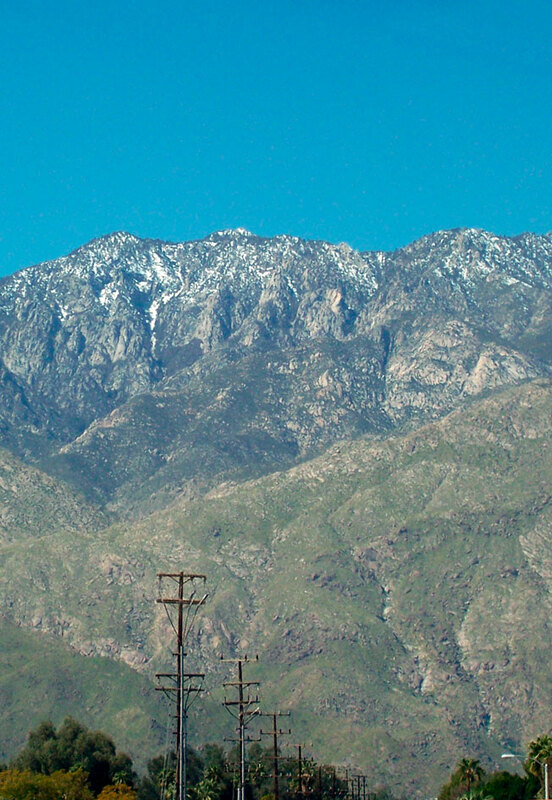 Extending from downtown to the airport is Tahquitz Canyone Way, Palm Springs most beautiful thoroughfare. 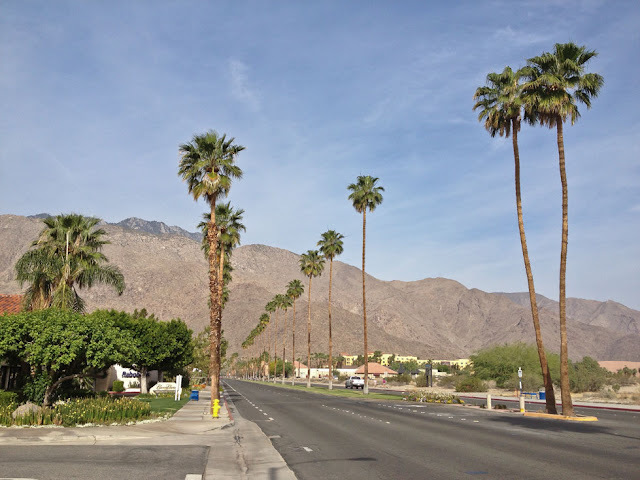 The wide street, lined with washingtonias (palms) is divided by a median strip, which shows off Palm Springs wide assortment of flowering plants. As you can see there is no traffic. The image was taken at around 8 am, a time when the traffic hasn't started to build up on many avenues and freeways. The distance between the corner of Tahquitz Canyon Way and Palm Canyon Drive to the airport is about 2 miles. For joggers, a jaunt up and down this street can be a non-challening hike over flat Coachella lands covered with Indian reservations. Talk about obscure names--John W. Williams. Who was he? I mean if they name a field after someone, why not someone whose name you recognize a little bit--say Pearl McCullum, one of the first hotel owners in the city of Palm Springs. Just who is John W. Williams? The obscure figure can be found in Frank Bogert's book Palm Springs: First Hundred Years. 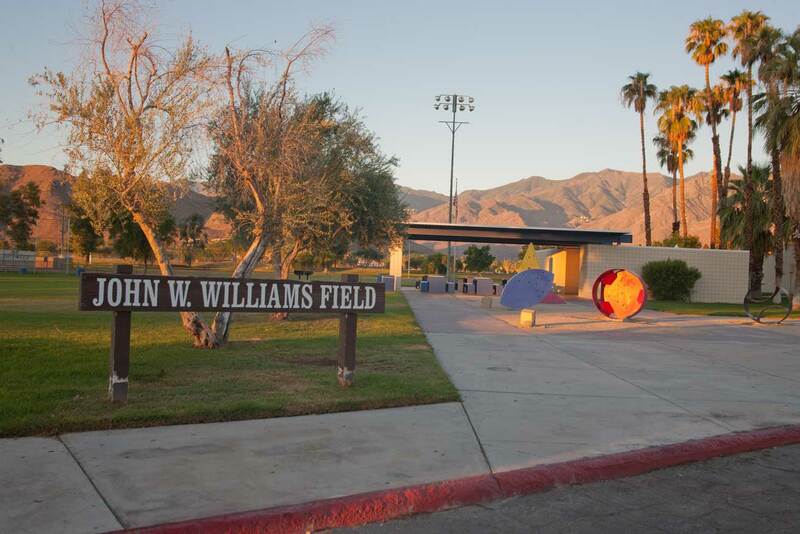 Evidently, Williams was a councilman from one Palm Springs "wards," or neighborhoods. My guess is he lived around Demuth Park, though back in 1938, I can hardly fathom that anything was built in the neighborhood. I had heard the Demuth Park neighborhood was built for "The Help," service people who worked for the rich, then living very close to the mountain (Mt. San Jacinto) near the Las Palmas neighborhood. Supposedly a few stars lived here, but I have to wonder why, since few of the homes are very elaborate. If you're a resident of Palm Springs, surely you've seen this type of rabbit. If you live near an area that has any vacant land near or around it, including golf courses, then you know this type of rabbit. They're especially plentiful on the golf courses that extend from Golf Club Drive near Cathedral City to Sunrise in Palm Springs. 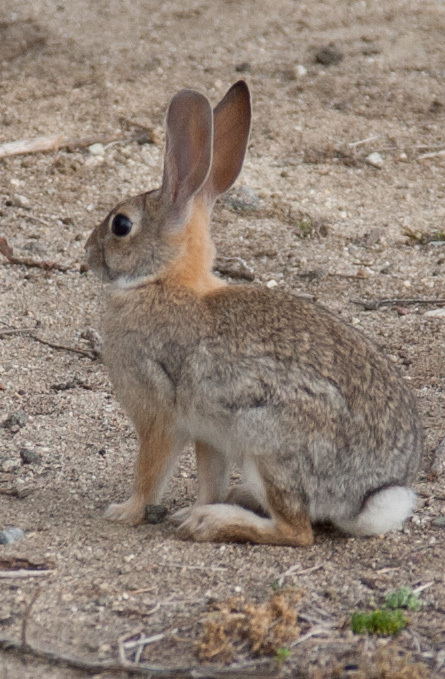 Perhaps your first guest as to what type of rabbit this is was a jackrabbit. We have those to, but the rabbit in the image above is not a jackrabbit. Its ears and body are too small. Jack rabbits live further into the desert. You might see one in South Palm Springs near Indian Canyons. How about a cottontail rabbit. Were you thinking that? Well...if you were you're close. The rabbit in the image above is a desert cottontail rabbit, pretty common in the Colorado Desert (not Mohave) where we are located. Desert cottontails like to be near golf courses because they eat grass. Their main predator is the coyote, which also can be found in Palm Springs. If you want to see these animals, take a hike at Indian Canyons in South Palm Springs. You might also catch a glimpse of them near downtown by walking southeast on Palm Canyon towards Sunny Dunes. Look for roadrunners too. They're beautiful. This weekend you probably saw parties everywhere, even attending one or two, a party weekend in Palm Springs, indeed. At the new Hard Rock hotel the younger generation was having a pool party upstairs in connection with Coachella, while the older one was having an art party fundraiser down below. The place lived up to its name. It was rockin'. The art party was a bit of a disappointment. Crowds of people gathered around small canvas art pieces that were hung on the wall, each for sale at $99 a pop. The artists who created the pieces were anonymous, except for a list of their names on the program. You had the chance to buy a piece painted or photographed by Suzanne Sommers and the like or from an ordinary, everyday artist. The pieces that shouted out the maze of small squares on the wall, were those with the brightest and boldest colors. Hmm. Would that be a hint a celebrity made it? Crooner Tony Bennett painted one too. Don't know who got it. Don't know what it'd be worth. 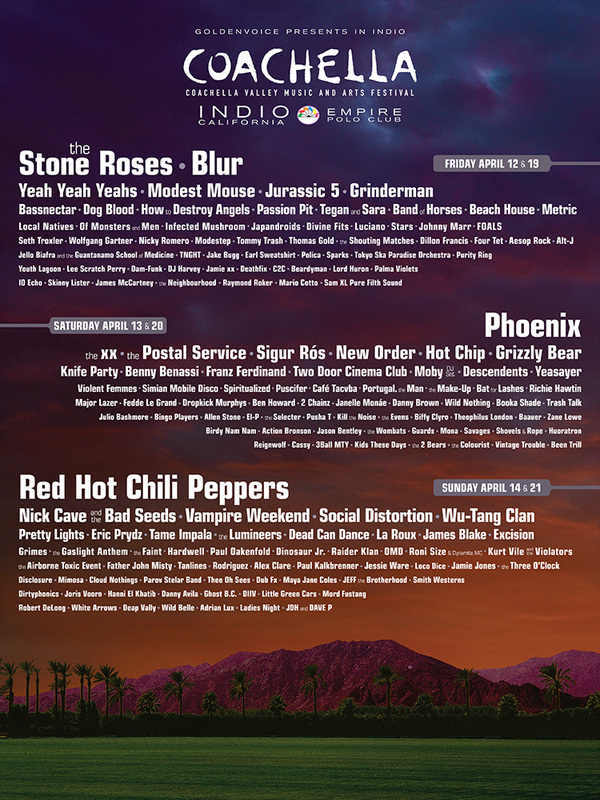 Can't wait for next weekend when Coachella's second week of acts comes to town. Anyone know of any other parties in Palm Springs? It's that time of year again--The Coachella Fest is jamming up Highway 10 East for miles and miles. The poster certainly is not rated G for General Audiences, but that won't stop the young ones from coming. Just who are these acts? Is the place family-friendly? Who can go? And what about the Stone Roses? Never heard of them? Leave a comment. Let us know who they are. I mean they have 500,000 fans on Facebook. Family friendly? Yeah, I guess. I've known some 40-somethings going with their 20-somethings children. Coachella is for all ages. Under five? You can get in free. This isn't the first home with a butterfly roof on this blog. One architect renowned for butterfly roofs was William Krisel. The style, as you can see from the image above, is one where two slanted parts of the roof meet each other in the middle. Some of Krisel's homes, which were built in the 1950s, came with butterfly roofs. The architect designed different roofs for some 2000 homes, many with unique slants that made the homes look similar to to one another. 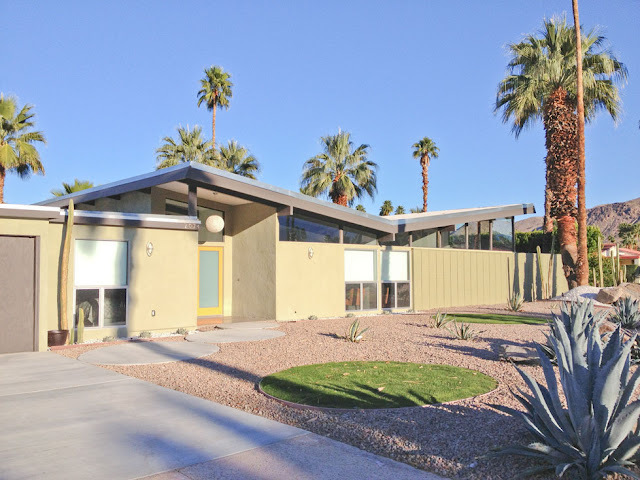 His homes were some of the first mass-produced modern homes in Palm Springs. Before the 1950s if you wanted a modern home, you'd pay a pretty penny for it. Krisel made homes with butterfly roofs affordable. Homes with butterfly roofs built by Krisel are often called Alexanders after the name of the developer of Krisel designed homes, Bob Alexander. Krisel didn't design individual homes, but preferred working with developers to build tracts of homes because these types of developments offered him steady work designing many homes. The homes originally sold for about $20,000, but today go for nearly a million for some of the higher-end ones. If you notice, the architecture of many of the new shopping developments contain buildings with slanted roofs. It's become a design that has a Palm Springs trademark. After last weekend's guys of the White Party, this weekend we have the Dinah Shore. 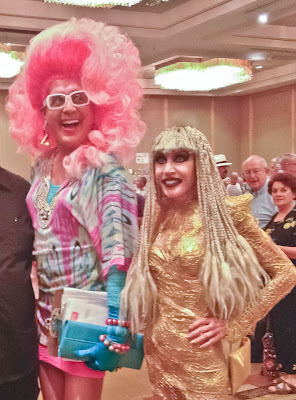 At this time of year, you see more than an ample supply of young women ready to party and shop among many other women and men promenading Palm Canyon in downtown Palm Springs. While Palm Springs is a premiere gay destination, attracting thousands of gay men an lesbians year-round, it's also a hipster paradise, a retirement community, a golf destination, a place for families and a film festival hotspot. On any weekend, you'll see a wide selection of people downtown, but on some weekends women outnumber men. This past weekend was one of those weekends. Dry year, indeed in Palm Springs, but how does it compare with other recent years? Here's the scoop on the rainfall this year compared to others in this century. The past two years have been dry, 40 percent of average, which is 5.23. Anyone for a rain dance?